Para.468 ASIC welcomes the anticipated benefits of the Australian Government’s 2012 insolvency law reform proposals, which largely aim to harmonise and align the systems of corporate and personal insolvency by introducing: (a) a streamlined model for winding up or restructuring small- and medium-sized enterprises; and (b) a review of current external administration options for restructuring large and complex, financially distressed companies to consider whether Australia could adopt attributes of external administration processes in other jurisdictions to achieve better outcomes. Para.469 However, we note that these proposals do not fully address the issue of perceived complexity in Australia’s insolvency regime, or the issue of the costs of the regime. 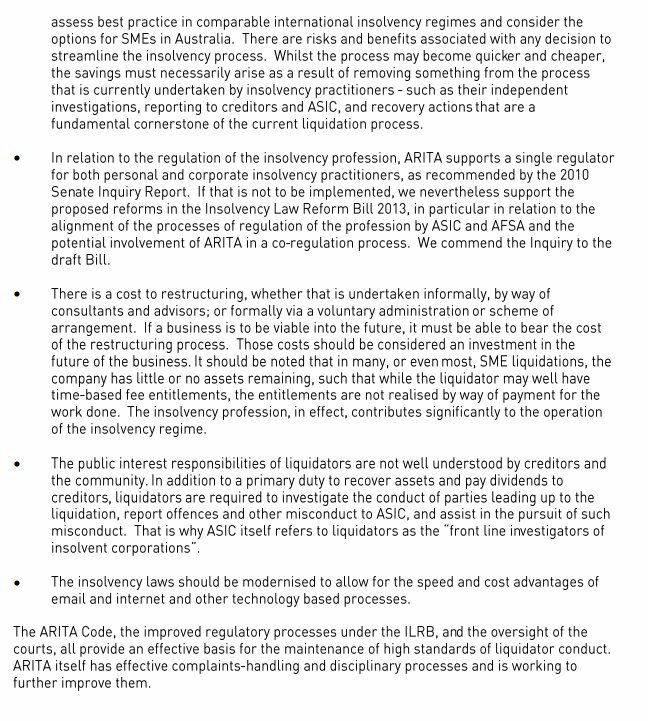 The law reform proposals arose out of the 2010 Senate inquiry into the conduct of insolvency practitioners and ASIC’s involvement. The 2010 Senate Inquiry’s terms of reference reflected concerns about registered liquidator conduct and ASIC’s supervision of registered liquidators, rather than more fundamental policy issues. Para.470 The vast majority of external administrations occur in the small- and medium-sized enterprise market. For these companies, the opportunity exists to consider how the winding up and restructuring processes might be further streamlined to reduce complexity and costs. Initiatives to reduce costs while appropriately remunerating registered liquidators for their work, increasing competition and ensuring consistency in external administration processes would also help maximise the potential return to creditors and help build confidence in the insolvency regime. Para.471 ASIC suggests that in considering how the external administration process can be streamlined for small- and medium-sized enterprises, consideration should be given to: (a) alternative funding models, as discussed in ASIC’s main submission to this inquiry and which are the subject of recommendations made by the Senate inquiry into the performance of the Australian Securities and Investments Commission. The funding model affects, among other things, the supervision of registered liquidators and, potentially, their remuneration; and (b) professional standards and regulation, including those relating to investigation and reporting to creditors and to ASIC. 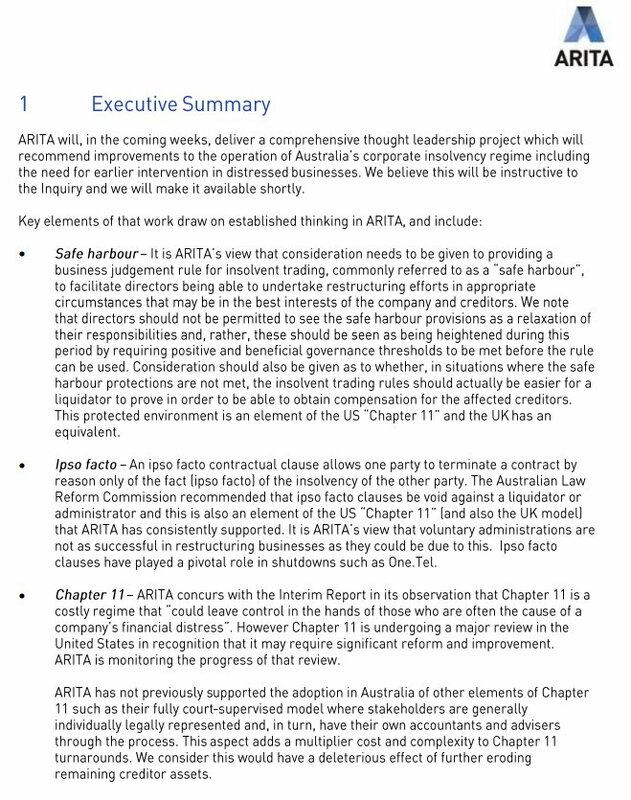 Para.472 ASIC is not aware of empirical evidence supporting the view that Australia’s external administration regime causes otherwise viable businesses to fail. If empirical evidence supporting the contention that viable companies unnecessarily enter external administration does exist, ASIC believes the Australian Government could consider legislative change that would address this, and that would achieve better outcomes for creditors. Para.473 We are aware, however, of concerns in the market that unnecessary external administrations, which destroy entity value and result in significant cost, are the result of: (a) a lack of a ‘safe harbour’ from what are said to be stringent insolvent trading laws (which can make a director personally liable for a company’s debts); and (b) the positive obligation/duty on directors to appoint an external administrator if their company is insolvent, or might become insolvent. Para.474 We acknowledge the possibility that the formal appointment of an external administrator can also reduce the value of a company’s business, and note that there is anecdotal evidence to support this view. Para.475 ASIC’s statistics on voluntary administration and deeds of company arrangement suggest that, for small companies, there is often not a viable business worth saving as many companies that enter voluntary administration end up in liquidation. This is supported by a recent review of 72 sample deeds of company arrangement (85% of which related to what might be described as small company insolvencies). The review found that 72% of these deeds were compromises akin to liquidation and involved no, or very limited, trading on of the business under the deed (although the dividend return paid to creditors was greater than that estimated if an immediate winding up of the company had occurred). In other words, the statistics show that companies often use the restructuring option of voluntary administration as a ‘quasi liquidation’. Para.476 The current insolvency legislation provides for the continuation of a viable business. Where there is a viable business of a company in liquidation, the liquidator has the ability to sell that business. Alternatively, the liquidator can appoint a voluntary administrator to facilitate the company’s restructuring with a view to its continued operation. Para.477 We note that four main reasons are often cited as inhibiting corporate restructuring in Australia: (a) the perceived stringency of our insolvent trading laws; (b) destruction of value by ipso facto clauses in contracts, which enable creditors to pursue enforcement action or enforce their contractual rights. This issue impacts on the extent of any moratorium on creditor claims during the period of a company’s restructuring; (c) a lack of formal ‘pre-pack sale’ regulation, which allows a sale of the business, or some company assets, to be negotiated prior to the appointment of an external administrator; and (d) the inability to bind third parties. Para.478 In principle, we consider these matters worthy of further discussion and consultation noting they have proved contentious in the past. Para.479 In terms of any legislative change, ASIC does not advocate a wholesale adoption of a US Chapter 11 style regime or other processes. However, we note that the US Chapter 11 regime, along with the administration regimes in the United Kingdom and Canada, might be worth examining to identify elements that could address the issues claimed to inhibit effective corporate restructuring in Australia. Para.480 We consider that a ‘one size fits all’ approach to the external administration or reorganisation of failed and distressed entities may not be appropriate. The framework for external administration needs to take account of the fact that issues affecting large proprietary and public companies differ from those affecting small- and medium-sized enterprises. Para.481 Legislative changes to facilitate corporate rehabilitation might therefore consider the different characteristics of large and small companies, and policy settings may need to be specifically tailored for these sectors, in order to promote deregulation, facilitate efficient reallocation of resources and improve competition.